The [rondel ] dagger draws its name from its round(or similarly shaped, e.g. octagonal)shape, hand guard and round or spherical pommel. Rondel means, as you can imagine, round or circular, and thus references the guard and pommel found on this dagger. The 15th Century Rondel Dagger is based on a historical piece that echoes the popular daggers of the fifteenth century, especially those that were favored secondary weapons and misericords by knights of the age. Rondel daggers were principally designed for use with a stabbing action, either underarm, or over arm with a reverse grip. They were ideal in battle for puncturing chain mail. they would also have been used for cutting. During the Battle of Agincourt in 1415, the rondel dagger was a knight's back-up weapon to be used in hand to hand fighting, and as such, one of their last lines of defense. This is a purely thrusting dagger, designed with a blade of hand-made steel in a reinforced design that puts all the impact onto the point. Historically, this would have allowed the dagger to easily slip between armor joints or small gaps, or even pierce mail. 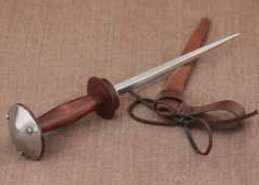 This dagger also features a round pommel with steel plating, as well as a shaped wooden grip. It comes complete with a hand-stitched leather scabbard as well, which can be easily suspended from a belt to keep this dagger directly at your side, within easy reach. For those who want that touch of historical accuracy in their look, this 15th Century Rondel Dagger is a good side-arm to feature and carry, as well as a great display piece to bring into your collection, too. The 15th Century; in a scene from a miniature by Girart de Roussillon depicting the construction of twelve churches in France (c. 1448), merchants and tradesmen can be seen wearing rondel daggers at their waists. This dagger is based on an original that currently resides in the collection of the museum in The Royal Armouries Leeds, UK. This page was last modified on 7 June 2014, at 15:43. This page has been accessed 26,473 times.